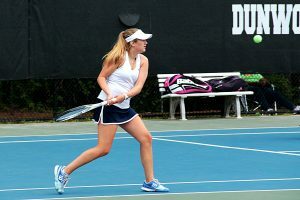 Strong play in the second round sent the Dunwoody Wildcats and Lady Wildcats into the third round (Elite 8) of the Class 5A state tennis playoffs on Monday at Dunwoody. The Wildcats (17-2) dominated Camden County 4-0 to reach the third round for the second consecutive season. No. 2 singles player Brandon Gita (11-5) gave the Wildcats their first point in the match with an easy 6-0, 6-0 victory over Camden’s Ziion Sibley. The No. 2 doubles team of Cade Lautenbacher and Adam Drucker made it 2-0 in favor of the Wildcats cruising to a 6-0, 6-2 victory over Hayrik Sailors and Christian Dusenberry. Lautenbacher and Drucker are 8-1 on the season. The next two points came from Cole Brainard at No. 1 singles and JT Melton and Daniel Bynum at No. 2 doubles. Brainard (11-3) swept Camden’s Walter Wright 6-1, 6-1. Melton and Bynum had a tough first set with Walter Vark and Trevor Pachard which was tied 4-4. They finished off the set with a 6-4 win and then went on to a 6-1 win to complete the match with the victory. No. 3 singles player Matthew Moussouri (7-0) was up 5-0 in the first set when the match ended. The Wildcats take on LaGrange today at 3:30 pm at Dunwoody. LaGrange advanced with a 5-0 win over Gainesville in the second round and 4-1 win over Northgate in the opening round of the state playoffs. The Lady Wildcats (16-5) advanced to the third round of the state playoffs for the first time since the 2009 season with a 3-1 victory over South Effingham at Dunwoody on Monday. The No. 1 doubles team of Allie Puckett and Jaydra Von Behren clinched the victory with a 6-3, 6-2 victory. They were leading the first set 4-3 and on serve when they broke the serve of the South Effingham duo to take a 5-3 lead on the way to the first set victory. They opened the second set with a break to jump out to a 4-1 lead and cruised to a 6-2 victory. The No. 2 doubles team of sophomore Ashton Harbin and freshman Gracie Arkaway rolled to a 6-1, 6-3 win in their match to give Dunwoody its first point. South Effingham tied the match at 1-1 with a win at No. 1 singles, but Dunwoody’s Lala Hamza took a 6-2, 6-1 win at No. 2 singles to put the Lady Wildcats within one of finishing the match at 2-1. Dunwoody faces the winner of the Columbus/Clarke Central winner in the third round. The date, site and time are yet to be determined. The Chamblee Lady Bulldogs (14-2) travel to West Laurens today (Tuesday) for their Class 4A girls’ state playoffs second round match at 5:00 pm. 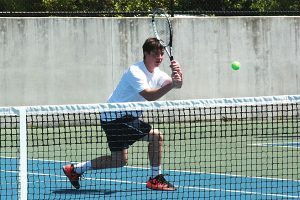 The Class 6A boys’ second round match between Lakeside (14-3) and Northview will resume where it left off last week at 4:15 pm at the DeKalb Tennis Center.